The TMS Instrumentation WorkShop for FireMonkey is a set of highly configurable commercial components for cross-platform (Win32, Win64, Mac OS X & iOS) FireMonkey instrumentation and multimedia applications. The set consists of approximately 15 components, including gauges (and guages), switches, LEDs, scopes, a clock, compass, spinner, slider, and a matrix label. You can watch a video of TMS Instrumentation WorkShop for FireMonkey, where TMS Software shows you the components in use in a FireMonkey HD application running on Windows 7 and the same application also deployed and running on Mac OS X Lion. Also, in the video, they turn the same application into a FireMonkey for iOS app and deploy to the iPad. They are commercial components but there is a free trial for you to try out first. 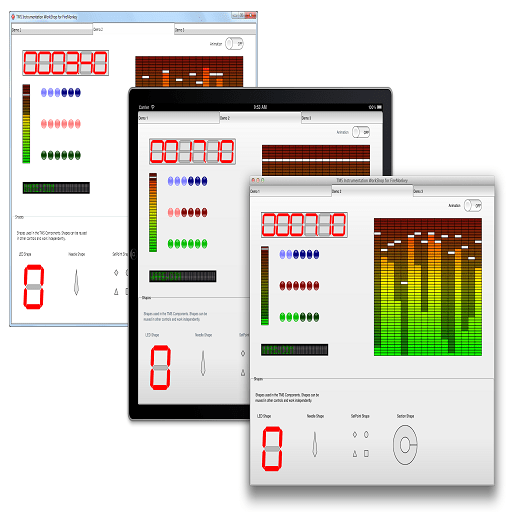 Visit TMS Software and download the free trial set of Instrumentation components!